Most cells in the human body use the sugar called glucose as their major source of energy. Glucose molecules are broken down within cells in order to produce adenosine triphosphate (ATP) molecules, energy-rich molecules that power numerous cellular processes. Glucose molecules are delivered to cells by the circulating blood and therefore, to ensure a constant supply of glucose to cells, it is essential that blood glucose levels be maintained at relatively constant levels. Level constancy is accomplished primarily through negative feedback systems, which ensure that blood glucose concentration is maintained within the normal range of 70 to 110 milligrams (0.0024 to 0.0038 ounces) of glucose per deciliter (approximately one-fifth of a pint) of blood. Negative feedback systems are processes that sense changes in the body and activate mechanisms that reverse the changes in order to restore conditions to their normal levels. Negative feedback systems are critically important in homeostasis, the maintenance of relatively constant internal conditions. Disruptions in homeostasis lead to potentially life-threatening situations. The maintenance of relatively constant blood glucose levels is essential for the health of cells and thus the health of the entire body. 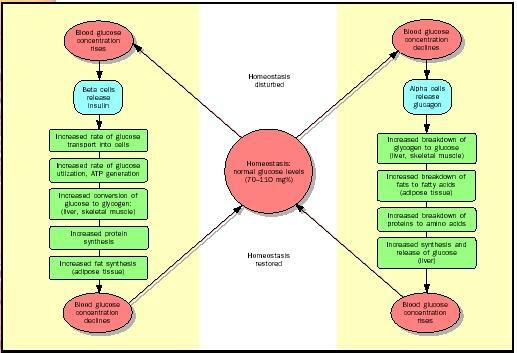 The homeostatic regulation of glucose concentrations. glucose levels include the transport of glucose into cells (for use as a source of energy or to be stored for future use) and the loss of glucose in urine (an abnormal event that occurs in diabetes mellitus). In a healthy person, blood glucose levels are restored to normal levels primarily through the actions of two pancreatic hormones , namely insulin and glucagon. If blood glucose levels rise (for example, during the fed or absorptive state, when a meal is digested and the nutrient molecules are being absorbed and used), the beta cells of the pancreas respond by secreting insulin. Insulin has several notable effects: (1) it stimulates most body cells to increase their rate of glucose uptake (transport) from the blood; (2) it increases the cellular rate of glucose utilization as an energy source; (3) it accelerates the formation of glycogen from glucose in liver and skeletal muscle cells; and (4) it stimulates fat synthesis (from glucose) in liver cells and adipose (fat) tissue. These effects collectively cause a decrease in blood glucose levels back to normal levels. If blood glucose levels fall below normal levels (for instance, during the post-absorptive or fasting state, when nutrients from a recently digested meal are no longer circulating in the blood, or during starvation), insulin secretion is inhibited and, at the same time, the alpha cells of the pancreas respond by secreting glucagon, a hormone that has several important effects: (1) it accelerates the breakdown of glycogen to glucose in liver and skeletal muscle cells; (2) it increases the breakdown of fats to fatty acids and glycerol in adipose tissue and, consequently, the release of these substances into the blood (which cells can thus use for energy); and (3) it stimulates liver cells to increase glucose synthesis (from glycerol absorbed from the blood) and glucose release into the blood. These effects collectively cause an increase in blood glucose levels back to normal levels. In addition to insulin and glucagon, there are several other hormones that can influence blood glucose levels. The most important ones are epinephrine, cortisol, and growth hormone, all of which can increase blood glucose levels. Glucose levels above or below the normal range are indicative of the presence of disease states. For example, elevated glucose levels are present in diabetes mellitus, Cushing's syndrome, liver disease, and hyperthyroidism, while decreased glucose levels are present in Addison's disease, hyperinsulinism, and hypothyroidism. The most prevalent of these diseases is diabetes mellitus. There are two types of this disease: Type I (insulin-dependent or juvenile-onset) diabetes mellitus, and Type II (noninsulin-dependent or maturity-onset) diabetes mellitus. In Type I diabetes, pancreatic beta cells are destroyed by an erroneous attack by the body's own immune system, and thus insulin secretion is reduced to negligible levels. In Type II diabetes, insulin secretion is not reduced; however, there is a reduced sensitivity of target cells to insulin, a phenomenon known as insulin resistance. Saladin, Kenneth S. Anatomy & Physiology: The Unity of Form and Function, 2nd ed. New York: McGraw-Hill, 2001. English chemist who won the 1964 Nobel Prize in chemistry for describing the structure of vitamin B 12 . In 1969, she completed a thirty-four-year effort to decipher the three-dimensional structure of insulin, the protein that helps people regulate blood sugar levels. If blood glucose levels fall below normal levels (for instance, during the post-absorptive or fasting state, when nutrients from a recently digested meal are no longer circulating in the blood, or during starvation), insulin secretion is inhibited and, at the same time, the alpha cells of the pancreas respond by secreting glucagon, a hormone that has several important effects: (1) it accelerates the breakdown of glycogen to glucose in liver and skeletal muscle cells; (2) it increases the breakdown of fats to fatty acids and glycerol in adipose tissue and, consequently, the release of these substances into the blood (which cells can thus use for energy); and (3) it stimulates liver cells to increase glucose synthesis (from glycerol absorbed from the blood) and glucose release into the blood. These effects collectively cause an increase in blood glucose levels back to normal levels..